Naples is located halfway between two volcanic areas, the volcano Mount Vesuvius and the Phlegraean Fields. The city is noted for its rich history, art, culture and gastronomy and, in the modern day, the historic centre of the city is listed by UNESCO as a World Heritage Site..
Sandwiched between a sleeping volcano and the steaming Campi Flegrei, Naples is a rumbling mass of contradictions. Extremes are something Naples does impressively well. Grimy streets hit palm-fringed boulevards, crumbling façades hide baroque ballrooms and cultish shrines flank cutting-edge clubs. One minute you’re in dusty Tangiers, the next you’re thinking of Paris. At its western edge, shop-heavy Via Toledo stretches from Piazza Trieste e Trento in the south to Parco di Capodimonte in the north; its chic southern end is a favourite haunt for sfogliatella-munching shopaholics. Immediately to the west lie the mean, washing-strung streets of the Quartieri Spagnoli. South of Via Toledo, regal Santa Lucia boasts the mighty Piazza del Plebiscito, Palazzo Reale and world opera great Teatro San Carlo. Close at hand, Castel Nuovo (Maschio Angioino) looms over Piazza del Municipio like a giant toy castle. Looking down on it all is middle-class Vomero, a leafy concoction of gorgeous Liberty villas, soulless apartment blocks and the hulking Castel Sant’Elmo. 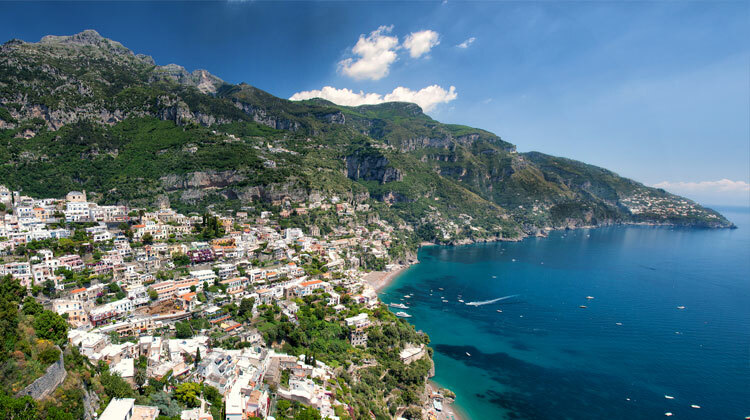 Positano is the coast's most expensive and photogenic town and Amalfi itself if a popular day-trip option, with the town of Ravello perched high on a hill looking down over it. Even Salerno, though mainly useful as a transport hub, has a lovely old town with winding medieval streets. Typical products from the area are, apart from pizza, seafood and white wine, lemons and all products made of it, such as the famous liqueur "Limoncello".